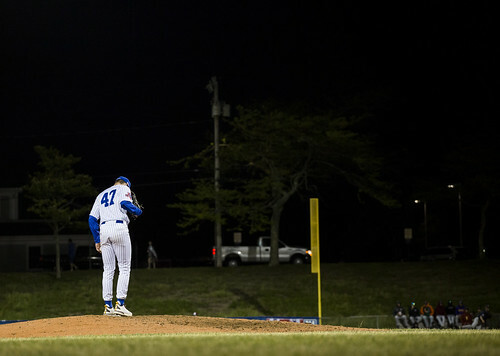 After falling to the Brewster Whitecaps on Tuesday night, the Chatham Anglers (15-14-2) will look to snap a two-game skid in a matchup against the Hyannis Harbor Hawks (17-10-2) on Wednesday night. The A’s remain in second place in the East Division and sit five games back of the Yarmouth-Dennis Red Sox and two games ahead of the Harwich Mariners. 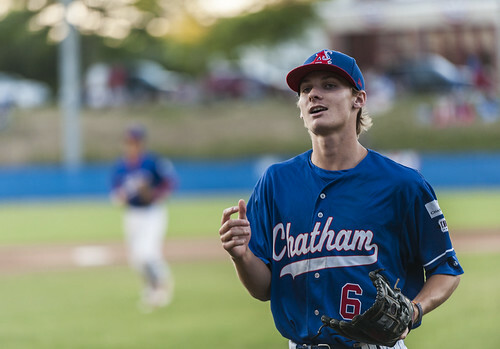 With four games to go before the All-Star Game on June 22, Chatham will look to break its shaky stretch and return to its winning ways before its next off day. 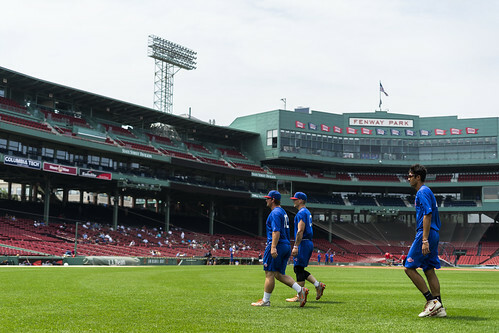 The Anglers spent Monday, their first off day in nine days, participating in MLB Scout Day at Fenway Park. All ten Cape League teams bussed up to Boston on Monday morning for the workout. The position players from each squad partook in batting practice, infield/outfield and a timed 60-yard dash. The pitchers who made the trip were responsible for shagging fly balls in the outfield during batting practice. See the full gallery of photos of the A’s workout at Fenway here. Over the last five games, the Anglers are hitting .287 with six home runs and 22 RBIs. Seven different players are hitting over .300 with Colin Simpson (10-for-16, four doubles, one triple and one homer) and Blake Sabol (6-for-17 and three round-trippers) leading the way. A lot has been made of the hot-hitting of Simpson, Sabol and Drew Mendoza (Florida State), but one guy who has been flying under the radar the last few days is Jorge Arenas (Stetson). Arenas has been one the A’s best defenders all season. He has made at least seven appearances at second base, shortstop and third base. But his swing really seems to be coming along over the last few days. The Stetson product is 4-for-8 with four RBIs over the last three games. Against Brewster on Tuesday, Arenas hit two RBI doubles down the right-field line — his first two extra-base hits of the season. During its two-game skid, one factor has primarily led to the Anglers’ downfall — allowing early runs. In its past two games, Chatham has allowed a combined seven runs in the first two frames, a recipe that usually leads to an A’s loss. When the Anglers fail to score the first run of the game, their record is 3-12-1. Chatham’s starting pitchers in its last two games — Jeff Belge (St. John’s) and Jack Conlon (San Jacinto) — each surrendered two home runs in their first two frames. "When you're down four in this league early, it makes you make a lot of decisions,” Holliday said. “It makes you think how many guys to burn out of the bullpen and what side of the bullpen you're going to go to." The A’s staff has allowed 21 runs in its last three contests, the second-worst three-game stretch it has had all season. From July 7 to 9, it allowed 25 runs in two losses and a win. Chatham has some of the best bullpen talent in the league. Dan Hammer (Pittsburgh), Troy Miller (Michigan) and Greg Veliz (Miami), who have combined for 43 innings in relief this season, were all selected as CCBL All-Stars on Saturday. Where the A’s bullpen falls short is with left-handers. Hammer, Miller and Veliz are all right-handed. Four active left-handed Anglers pitchers — Belge, Nick Scheidler (UCLA), Spencer Van Scoyoc (Arizona State) and Zack Noll (Point Loma Nazarene) — have made relief appearances and have not had overwhelming success. Belge, who has tossed more innings (26) than any Chatham pitcher on the summer, has been the best of the group. But second-year A’s player has primarily been a starter the last month. Three of his last four appearances have been starts and his last relief outing came on July 3 against Harwich. The left-hander has struck out 18 batters and allowed five runs in 13 innings of relief in 2018. Noll, Scheidler and Van Scoyoc have combined to allow 19 runs on 22 hits in 25.1 innings out of the bullpen. The trio of hurlers have also struggled with command, walking a combined 24 batters. “The left-handed side of our bullpen, it’s not real comfortable,” Holliday said. Spencer Torkelson (Arizona State) returned from Team USA on Monday and was immediately activated on Tuesday. Torkelson struggled when he first arrived with Team USA but finished the campaign strong. In 12 games, Torkelson hit .286 with 10 hits, three runs scored and eight walks — which was tied for the team-high. The rising sophomore hit all over the lineup, racking up appearances in the two-, three-, four-, five, seven- and eight-spot. In the field, he played first base, left field and right field in addition to starting a few games as the designated hitter. Torkelson’s best game of the 15-game stretch was against Japan on July 9. Despite Team USA losing the game, 4-3, in 11 innings, Torkelson went 3-for-3 with an RBI. In his first game back with Chatham, Torkelson roped the first pitch he saw for a double. He ended the game 1-for-3 with a walk and an error in right field. Branden Fryman (Samford) — who was dealing with multiple ailments — was released Tuesday. Fryman primarily came off the bench under Holliday, tallying 30 at-bats in 22 appearances. Fryman had one of the smoothest fielding motions on the team, using a rapid glove-to-hand transfer to staple himself in as a reliable middle infielder. The Samford product reached base 15 times (eight hits, seven walks) during his time in Chatham and stole five bases. Fryman is the only A’s player to record more than two stolen bags and not get caught stealing. Fryman’s speed on the basepaths often resulted in him crossing the plate. The Florida native scored seven runs on the summer, ranking above four Anglers players who registered 45 or more at-bats compared to Fryman’s 30. Although he was not an everyday player, his contributions on both sides of the ball will be missed by Chatham. The Anglers begin a three-game road trip Wednesday, starting with their first visit of the summer to McKeon Park to face the Harbor Hawks at 6 p.m. Chatham will then travel to Brewster and Cotuit in the following two days before returning to Veterans Field on Saturday against Y-D.
Broadcast coverage of the Anglers and Harbor Hawks on Wednesday begins at 5:40 p.m. with the Anglers Extra Pregame Show. Listen to Cooper Boardman and Josh Schaefer on TRZ Teamline or listen by phone at 1-800-846-4700, code 3841. For more information, visit Broadcast Central.